Bus from Johor Bahru to Kuantan is the preferred public transport by locals. With the costly flight fare and lack of KTM train network, bus service becomes the only affordable choice for commuters. Maju Express, Transnasional and Plusliner are the few reliable and reputable coach companies in offering bus service from Johor Bahru to Kuantan. Maju Express is well-known with its comfortable seat by having the thick cushion in passenger seat, whereas Transnasional is reputable with its reliability because of its government bus status. The duration from Johor Bahru to Kuantan takes about 6 hours depending on traffic condition. The bus fare for bus from Johor Bahru to Kuantan costs about of RM 29.10. Because of limited departure from Singapore to Kuantan, many travel from Singapore to Johor Bahru Larkin Bus Terminal to take the bus from Johor Bahru to Kuantan. 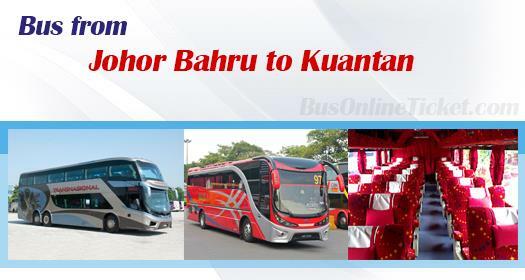 The frequent bus schedule from Johor Bahru to Kuantan offers flexible traveling time for passengers. The first bus starts as early as morning 09:00 and the last bus leaves as late as midnight 23:30. There are a lot of notorious touting activities In Johor Bahru Larkin bus terminal. The best way to avoid it is to purchase the bus ticket in advance via online with BusOnlineTicket.com. Usually they will not continue to bother you after telling them you already have ticket. The coach would pass by Kota Tinggi Bus Station and then Mersing Bus Station for passengers drop off before heading to Endau for toilet break stopover. After the stopover, the coach heads directly to Terminal Sentral Kuantan. Hence, booking your bus ticket at BusOnlineTicket.com is not just hassle-free and convenient, but it also helps you to avoid those touting agents in Larkin bus terminal.